Also known as Biligirirangana Hills, this stunning hill range is located in the Karnataka state of India and is popular for its unblemished and untouched beauty. Even though it has become a common name amongst nature lovers, its hidden charm is still left to be explored. Settling peacefully between the Eastern and the Western Ghats, BR Hills is a protected reserve now and has been nurturing several species of animals and plants. 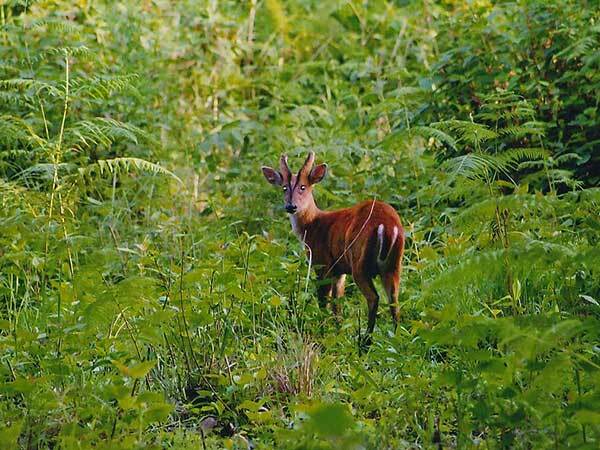 The major wildlife in these luxuriant forests of BR Hills include sambar, chital, brown fish owl, striped tiger, gaur, etc. Apart from enjoying the wildlife, you can also visit several other tourist destinations in the locality of BR Hills, such as temples, ancient trees, etc. So, how about being surrounded by the enigmatic appeal of BR Hills? If you are looking to spend your time amid the flourishing beauty of BR Hills at its best, then the appropriate time to visit BR Hills is from April until the end of November, as during this period of time, the natural charm of the forests is at its peak and the weather is cool and pleasant enough to walk around; immerse yourself in the hush of the forests and wildlife of BR Hills. By Air: You can take a flight to Mysuru and then from there take a cab to BR Hills. Mysuru airport is at a distance of 80 km from BR Hills. By Rail: There are no direct trains between BR Hills and Chennai. However, you can catch a train from Chennai station to Mysuru and then from there take a cab to BR Hills. By Road: Situated at a distance of about 500 km from Chennai, BR Hills is easily accessible by road from Chennai and other major cities. You can take a cab from Chennai to BR Hills. However, route 1 is the fastest and the most comfortable one. If you desire to reach your destination within minimum time, it is advisable to take route 1. Once you are on your way to BR Hills, you can explore and take a break at the following places. On the banks of Vegavathi river is settled one of the most beautiful and spiritual towns in Tamil Nadu, Kanchipuram. Famous for its ancient temples and Kanchipuram silk, this popular town boasts of its image as a spiritual city. It is also famous amongst tourists for its wonderful architecture of historical buildings and temples where you can see an incredible work on patterns and designs. How about stopping at this religious and silk centre while on your way to BR Hills? Vellore is one of the most-visited places in Tamil Nadu because of its historical significance and exotic beauty spread across its pristine hills and lush green forests. On one side, you can explore the history of the town through its ancient temples and age-old buildings and on another side, you can roam in and around the perennial charm of its religious sites. How about savouring the perfect mix of nature, history and spirituality? How about taking a break at the Silicon Valley and the Garden City of India while on your way to BR Hills? From beautiful gardens to historical monuments and dazzling lakes to modern architecture, this hi-tech city of India has everything in its pocket to entertain its visitors. Being home to numerous multinational companies, it is one of the major developing cities in India and today, it has become a significant tourist destination throughout the year. Dedicated to Lord Ranganatha, it is one of the major attractions in BR Hills. Biligiri Rangaswamy Temple is the only temple in India where Lord Ranganatha's statue is in a standing position. Every year, this popular temple hosts Rath Festival where you can see numerous Hindu devotees and other enthusiasts gathered to enjoy the grandeur of the temple during these festive periods. The major attraction for the nature lovers in BR Hills is its wildlife sanctuary. BRT Wildlife Sanctuary, otherwise known as Biligiri Ranganathaswamy Temple Wildlife Sanctuary, has become a favourite picnic spot over the last few years on account of its natural beauty and entertainment options. It provides you with the spectacular views of wildlife amidst the rich green forests and an opportunity to relax under the dense canopy formed by its trees. The worshipping site of the tribals of BR Hills is the Dodda Sampige Mara, also known as the Big Champak Tree. This surprising tree is considered to be thousands of years old and has become a tourist destination for the visitors of BR Hills. Why not visit this amazing creation of Mother Nature?